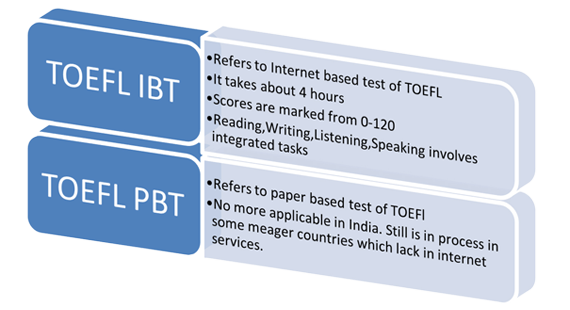 TOEFL, formally known as “Test of English as a Foreign Language”, is an English proficiency test for those non-native English speakers who want to study overseas, in English speaking countries. It was first administered in 1964. The TOEFL test is the most widely respected English-language test in the world, recognized by more than 9,000 colleges, universities and agencies in more than 130 countries, including Australia, Canada, the U.K. and the United States. It also stands in need of other English speaking countries. It is administered by Educational Testing Services (ETS) and is taken at various locations in India, as Internet Based test. It is also mandatory for various Government agencies, licensing bodies, businesses and many institutions. TOEFL score is valid for 2 years. Wrting 50 minutes 2 tasks Write essay responses based on reading and listening tasks; support an opinion in writing. How do I register for the TOEFL®? How many times in a year is the TOEFL® exam held? Yes, the test is given in one day. The test takes about 4 hours, but with check-in you should plan to be at the test center for at least 4½ hours. How many times can I take the TOEFL®? TOEFL® can be taken unlimited number of times. What is the validity of the TOEFL® exam? Your TOEFL® score will be valid for 2 years from the date the test was taken. The universities only accept official scores sent directly by ETS. Scores to four colleges can be sent free of cost from the time of TOEFL® registration to 24 hours before the test date. Subsequently, for each score report sent to a college, you would have to pay $19. If I take the TOEFL® more than once, which score will be considered by the universities? Do I need to have the TOEFL® score at the time of applying to universities? Is the TOEFL® mandatory for applying to undergrad programs outside India? TOEFL® is mandatory for Undergraduate, MS, PhD and most MBA courses across the world. What is the minimum TOEFL® score that I need?